So what is the trick with these carbs? And does it really matter if we're eating a lot of simple or complex carbs? Simple Carbohydrates are turned into glucose quickly while complex carbs take longer to change into glucose. What does this do for you? Simple carbs give you quick boosts of energy while complex lengthen out sustained energy for your body. Translation: complex carbs fill you up much better then simple. 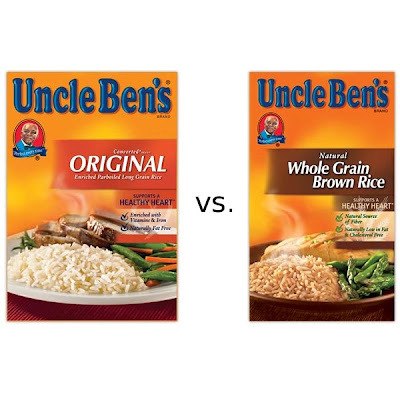 Here is a great example: the difference between white rice, an enriched grain, which falls in the simple carb category vs. brown rice, which is a complex carb. Interestingly, both are rice, but both with give energy in a different way and fill your appetite differently. The brown rice will sustain you much longer then the white rice. Another bonus to filling most of your daily carbs with complex is the additional fiber, vitamins, and nutrients found within most. The brown rice, for example, has about 3.5g of fiber per cup, while the white rice doesn't even have 1g per cup. In conclusion, eat both simple and complex carbs, but mostly complex in your diet. When eating simple carbs, eat fruit, yogurt, and milk, and avoid the refined white and brown sugars, enriched breads, cereals and sweets. You CAN turn many of your current "simple" foods into complex, which would totally improve the function of your body, appetite, and energy. Give you and your kids something to actually satisfy their appetite!